The CM235 consists of rectangular plate, mounting bracket, U-bolts, lock washers, and nuts. It allows one peripheral with a magnetic base to be mounted to a crossarm or mast. Devices that have a magnetic base include our GPS16X-HVS Geographic Position Receiver, some GPS antennas, and some short-range omnidirectional antennas. 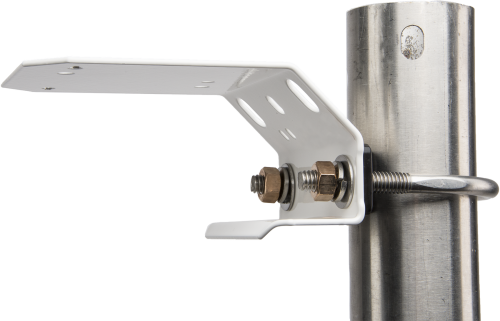 Devices that have a magnetic base include our GPS16X-HVS Geographic Position Receiver, some GPS antennas, and some short-range omnidirectional antennas. The U-bolt and V-block use the bracket's bottom holes to attach to a crossarm. The U-bolt and V-block use the bracket's side holes to attach to a tripod or tower mast or to a user-supplied vertical pole. The CM235 can mount to a 0.75 to 1 in. IPS pipe (1 to 1.5 in. OD).